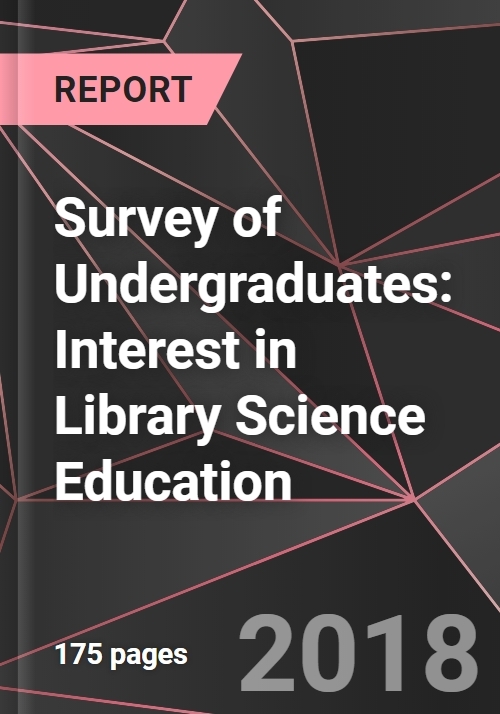 This path-breaking 175-page report presents data on undergraduate views of the desirability and need for library science education, measuring interest in undergraduate courses and MLS education. The report also tracks the percentage of undergraduates who have ever worked in an academic, public or special library, with separate data for each type of library. The report also measures undergraduate interest in a myriad of library science subject areas with distinct data sets for interest in special collections, cataloguing and metadata, law/business librarianship, social science librarianship, hard sciences librarianship, digitization and preservation, library info technology, purchasing and management and other areas. The study is an important resource for anyone trying to develop or market courses, webinars, conferences and other library science education resources. Data is based on a survey of 1,566 undergraduates at 4-year colleges and universities in the USA. Data in the report is presented in the aggregate and broken out by 18 variables including but not limited to gender, family or origin income level, SAT/ACT scores, college grades, sexual orientation, college major or intended major, college year of class standing, age, public/private school status, political convictions and many other useful variables. It enables report end users to hone in on exactly the type of student most interested in a particular field of library science. Women were twice as likely as men to indicate interest in pursuing some form of undergraduate library science education (4.59% vs. 2.21%). Overall, 2.17% of respondents indicated they were interested or highly interested in undergrad courses in cataloguing and metadata. Respondents from private colleges were somewhat more likely than those from public colleges to indicate they were interested or highly interested in courses in library information architecture (3.74% vs. 2.42%). Groups more likely to report having ever worked in an academic library include: respondents who grew up in major cities (7.76%) or small or medium sized cities (7.37%) or in the South (8.76%) or abroad (7.32%). How interested are you in taking courses in library science at the undergraduate level? How likely are you to pursue a graduate program in library science at some point in the future? How likely do you think it will be that at some point in the future you will really need the kinds of skills developed in library science classes? Table 1.1 How interested are you in taking courses in library science at the undergraduate level? Table 1.7 How interested are you in taking courses in library science at the undergraduate level? Broken out by degree of religiosity of the survey participant? Table 1.17 How interested are you in taking courses in library science at the undergraduate level? Broken out by which phrase best describes your racial or ethnic identity? Table 1.18 How interested are you in taking courses in library science at the undergraduate level? Broken out by what do you expect will be your total accumulated student loan debt when you graduate your undergraduate institution? Table 2.1.7 Rate your level of interest in the cataloguing and metadata area of library and information science Broken out by degree of religiosity of the survey participant? Table 2.1.17 Rate your level of interest in the cataloguing and metadata area of library and information science Broken out by which phrase best describes your racial or ethnic identity? Table 2.1.18 Rate your level of interest in the cataloguing and metadata area of library and information science Broken out by what do you expect will be your total accumulated student loan debt when you graduate your undergraduate institution? Table 2.2.7 Rate your level of interest in the preservation, digitization and special collections area of library and information science Broken out by degree of religiosity of the survey participant? Table 2.2.17 Rate your level of interest in the preservation, digitization and special collections area of library and information science Broken out by which phrase best describes your racial or ethnic identity? Table 2.2.18 Rate your level of interest in the preservation, digitization and special collections area of library and information science Broken out by what do you expect will be your total accumulated student loan debt when you graduate your undergraduate institution? Table 2.3.7 Rate your level of interest in the law and business area of library and information science Broken out by degree of religiosity of the survey participant? Table 2.3.17 Rate your level of interest in the law and business area of library and information science Broken out by which phrase best describes your racial or ethnic identity? Table 2.3.18 Rate your level of interest in the law and business area of library and information science Broken out by what do you expect will be your total accumulated student loan debt when you graduate your undergraduate institution? Table 2.4.7 Rate your level of interest in the science area of library and information science Broken out by degree of religiosity of the survey participant? Table 2.4.17 Rate your level of interest in the science area of library and information science Broken out by which phrase best describes your racial or ethnic identity? Table 2.4.18 Rate your level of interest in the science area of library and information science Broken out by what do you expect will be your total accumulated student loan debt when you graduate your undergraduate institution? Table 2.5.7 Rate your level of interest in the social science area of library and information science Broken out by degree of religiosity of the survey participant? Table 2.5.17 Rate your level of interest in the social science area of library and information science Broken out by which phrase best describes your racial or ethnic identity? Table 2.5.18 Rate your level of interest in the social science area of library and information science Broken out by what do you expect will be your total accumulated student loan debt when you graduate your undergraduate institution? Table 2.6.7 Rate your level of interest in the Info architecture: technical development of websites, intranets, online communities and finding aids area of library and information science Broken out by degree of religiosity of the survey participant? Table 2.6.17 Rate your level of interest in the Info architecture: technical development of websites, intranets, online communities and finding aids area of library and information science Broken out by which phrase best describes your racial or ethnic identity? Table 2.6.18 Rate your level of interest in the Info architecture: technical development of websites, intranets, online communities and finding aids area of library and information science Broken out by what do you expect will be your total accumulated student loan debt when you graduate your undergraduate institution? Table 2.7.7 Rate your level of interest in the information purchasing and management area of library and information science Broken out by degree of religiosity of the survey participant? Table 2.7.17 Rate your level of interest in the information purchasing and management area of library and information science Broken out by which phrase best describes your racial or ethnic identity? Table 2.7.18 Rate your level of interest in the information purchasing and management area of library and information science Broken out by what do you expect will be your total accumulated student loan debt when you graduate your undergraduate institution? Table 2.8.7 Rate your level of interest in the digital image management area of library and information science Broken out by degree of religiosity of the survey participant? Table 2.8.17 Rate your level of interest in the digital image management area of library and information science Broken out by which phrase best describes your racial or ethnic identity? Table 2.8.18 Rate your level of interest in the digital image management area of library and information science Broken out by what do you expect will be your total accumulated student loan debt when you graduate your undergraduate institution? Table 3.1 How likely are you to pursue a graduate program in library science at some point in the future? Table 3.7 How likely are you to pursue a graduate program in library science at some point in the future? Broken out by degree of religiosity of the survey participant? Table 3.17 How likely are you to pursue a graduate program in library science at some point in the future? Broken out by which phrase best describes your racial or ethnic identity? Table 3.18 How likely are you to pursue a graduate program in library science at some point in the future? Broken out by what do you expect will be your total accumulated student loan debt when you graduate your undergraduate institution? Table 4 Have you ever worked in any capacity in any of the following? Table 4.1.1 Have you ever worked in a university or college Library? Table 4.1.7Have you ever worked in a university or college library? Broken out by degree of religiosity of the survey participant? Table 4.1.17 Have you ever worked in a university or college library? Broken out by which phrase best describes your racial or ethnic identity? Table 4.1.18Have you ever worked in a university or college library? Broken out by what do you expect will be your total accumulated student loan debt when you graduate your undergraduate institution? Table 4.2.1 Have you ever worked in a public Library? Table 4.2.7 Have you ever worked in a public library? Broken out by degree of religiosity of the survey participant? Table 4.2.17 Have you ever worked in a public library? Broken out by which phrase best describes your racial or ethnic identity? Table 4.2.18 Have you ever worked in a public library? Broken out by what do you expect will be your total accumulated student loan debt when you graduate your undergraduate institution? Table 4.3.1 Have you ever worked in a corporate, legal or other special Library? Table 4.3.7 Have you ever worked in a corporate, legal or other special library? Broken out by degree of religiosity of the survey participant? Table 4.3.17 Have you ever worked in a corporate, legal or other special library? Broken out by which phrase best describes your racial or ethnic identity? Table 4.3.18 Have you ever worked in a corporate, legal or other special library? Broken out by what do you expect will be your total accumulated student loan debt when you graduate your undergraduate institution? Table 5.1 How likely do you think it will be that at some point in the future you will really need the kinds of skills developed in library science classes? Table 5.7 How likely do you think it will be that at some point in the future you will really need the kinds of skills developed in library science classes? Broken out by degree of religiosity of the survey participant? Table 5.17 How likely do you think it will be that at some point in the future you will really need the kinds of skills developed in library science classes? Broken out by which phrase best describes your racial or ethnic identity? Table 5.18 How likely do you think it will be that at some point in the future you will really need the kinds of skills developed in library science classes? Broken out by what do you expect will be your total accumulated student loan debt when you graduate your undergraduate institution?